In July, Digiti Sonus, an artwork about fingerprint sonification by Yoon and me, was introduced on artwork installation section in ACM SIGGRAPH 2013. 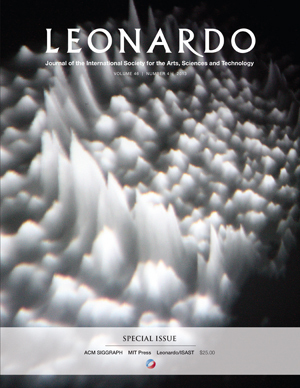 Simultaneously, our work was also introduced on the front cover of the famous Leonard Journal! Currently I'm building the Digiti Sonus special page on my web page. Before the completion, please visit following links for gathering additional information about our recent work! Thank you for visiting my new homepage! Interestingly, I'm using my own customized PHP-based framework for maintaining all the contents on the web site. Still I'm working to refine my personal web page for applying the brand-new HTML5 and CSS3 technologies, so, sometimes my web page shows very weird style. 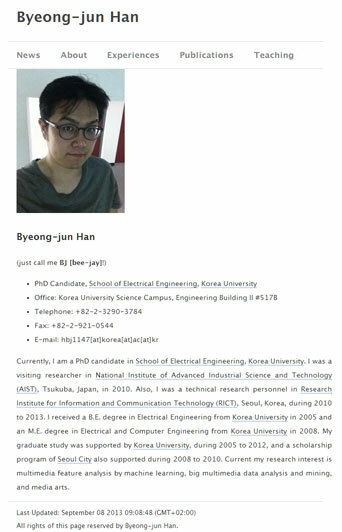 If you have any comments or opinions in order for improving my web page better, please do not hesitate to contact to me!